As the inaugural production of their 20th anniversary season, Luna Stage has chosen a play that may not be everyone's cup of tea but certainly fulfills their mission slogan to "Illuminate. Imagine. Transform." Vita and Virginia, penned by Eileen Atkins from the letters written to each other by these singular women, recounts the complicated relationship between the English novelist Virginia Woolf and the globe-trotting aristocrat, Vita Sackville-West, as it unfolded over nearly two decades in the first half of the 20th century. "Playwright" Eileen Atkins (co-author with Jean Marsh of the original Upstairs, Downstairs) has mined the women's correspondence and come up with an intelligent play that, while much talk and next to no action, sounds like a conversation that transcends the constraints of time and place to feel dynamic and fresh. At the end of two hours, we really feel like we know the two. Directed by Jane Mandel, the entire Luna Stage production team makes this possible. C. Murdock Lucas' set and Deborah Caney's costumes tell us just who these women are. The middle class, more feminine Virginia writes at a worn pastel green desk, wears dresses and skirts, feathered hats and a shawl, while the upper class, more mannish Vita wears beautifully tailored suits and trousers, wing-tipped high-heeled oxford shoes, silk blouses and ropes of pearls as she writes at her elegant walnut desk. Two parts of the conflict, class and style, are there before our eyes throughout the entire proceedings. The third aspect, envy (and on the part of Vita, competition), crackles in the dialogue. Virginia envies Vita's style (but not enough to do anything about remaking her own image) and other admirers (i.e., lovers). Vita envies Virginia's enormous literary talent and success, and maybe a bit, her solid and loving marriage to Leonard. Vita is married to Harold Nicolson, but theirs is an "open marriage," for both are gay. I am not sure one has to know a great deal about Virginia and Vita, for Mona Hennessy and Rachel Black Spaulding portray them, respectively, splendidly. Spaulding's Vita is a predator who seduces Virginia with compliments, calling her book The Common Reader a "guide, a philosopher, a friend." Handsome, manly, this Vita knows exactly what she's doing with the more compliant and needy housewife/author Virginia, going so far as to abuse Virginia by flaunting her conquests in letters. Vita is "in full sail on high tide while Virginia is on still back waters." As Virginia, Hennessy is the more likable of the correspondents. Self-deprecating, she acknowledges her dowdy attire but, unlike Vita who fritters her day away, she critiques others’ poetry, runs Hogarth Press with her husband, writes novels, all while suffering from chronic migraine headaches, depression and recurrent respiratory infections. It is wonderful to see Hennessy onstage again after a stint as Luna Stage's Managing Director. Her performance conveys Virginia's motherly warmth (although she never had children of her own, she grieves over the death of her nephew in the Spanish Civil War) as well as pride in her ability to write ("I do write damn well sometimes," she avers). The two women’s different needs are clearly apparent as well. Spaulding's Vita's seem to be more physical, more sexual, as she says, "like smoking over a petrol tank." Virginia's are more psychological; writing in "a sordid room," not the estates or exotic locales inhabited by Vita, cleaning the kitchen or cooking, her doubts are bolstered by Vita's compliments, and she blossoms under the female companionship, even if it exists mostly on paper. But she manages to hold her own under Vita's steamroller of passion claiming that no one can own her and by writing Orlando, a semi-biographical novel about Vita, with a sly dig by having her protagonist switch gender roles. Vita called it "a new form of narcissism." If the first act of the play seethes with sexual passion, overt and repressed, the second half is ruled by jealousy, illness and war. Vita is cruel. Virginia whines when Vita lunches at a nearby cafe but does not visit her; she's put out when Vita sends a copy of her book of poems to others but not to her. "Am I not a critic too?" she asks. She's especially enraged when Vita dedicates that book to another one of her lovers (Clear plastic human forms floating face down above the stage as though watching represent these people). They even quarrel over a minor sum of money. This makes the second act feel very long, although I don't know what could have been trimmed since the "action" follows the women's real lives. The other problem is that sometimes the dialogue sounds more like words written on paper than a real conversation. Vocabulary like "deliquesce" (to become soft with age and maturity) and "valetudinarian" (a person of weak or sickly constitution; one overly concerned with her health) are not often heard, if ever, in modern conversation; that Virginia uses them shows her literary bent and fondness for language. And don't worry if you do not recognize many of the persons mentioned in the play; the playbill has a list of names, places and books to consult should you be confused, and there is a streaming video on view just outside the theater door. Vita and Virginia will illuminate as you imagine the lives of two fascinating women, and it will transform by exposing you to a footnote in literary history told through letters. While a lesbian relationship might not be as shocking today as it was in the second quarter of the previous century, the eloquence of the two parties will engross you, enrapture you and enliven your appreciation for the complications of female relationships. Who knows? You may even seek out works by Virginia and Vita to read. That way, the two women will continue to live beyond the printed page and long after the stage lights have come down. 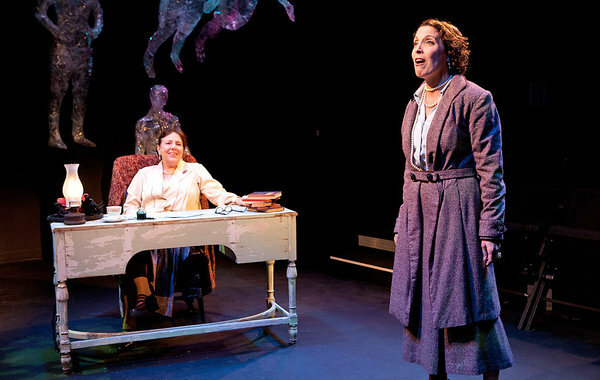 Vita and Virginia will be performed at Luna Stage, 555 Valley Road, West Orange, through October 28. For information and tickets, call the box office at 973.395.5551 or visit online www.lunastage.org. CALL FOR GINGERBREAD WONDERLAND ENTRIES!